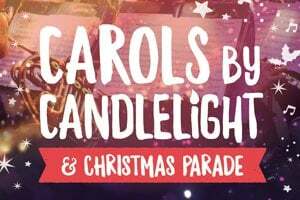 With thousands joining in the festivities, Carols by Candlelight is the perfect mix of high quality music with families enjoying the Christmas spirit in the lead up to Christmas. The evening begins early with the Christmas Parade travelling through the Jull Street Mall to Memorial Park featuring colourful characters and performances by performers and local community groups including Just Brass Armadale, Explosive Dance and Theatre Company and Jolette’s Gymnastics. After reaching Memorial Park, Santa Clause will share some special words before heading back to the North Pole. Collect a songbook and LED candles to join in the musical spectacular with performances by Armadale Primary School, Clifton Hills Primary School, Australian Christian College – Darling Downs, Classic Sounds Vocal Ensemble and Roleystone Theatre Group Choir, supported with live music provided by the highly acclaimed and award winning Armadale City Concert Band. Home to the annual Salvation Army Christmas Food Bank, we encourage you to bring down non-perishable food items to give some festive cheer to the tables of people in need this Christmas. Check out the suggested list of items to bring. 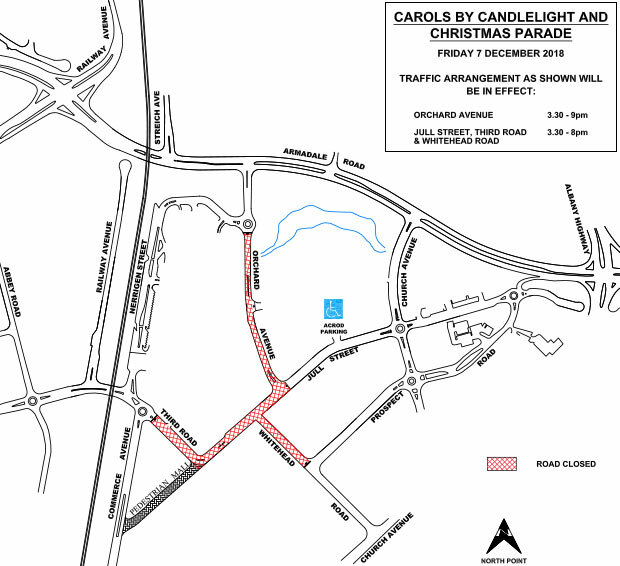 Road closures will be in effect so please plan your trip accordingly. This is an alcohol and smoke free event, sponsored by Sizzler Australia. This event will host two Auslan Interpreters located on the stage and broadcasted to the screen. There will be a designated Accessible Viewing Area at the top of Memorial Park amphitheatre for people with mobility challenges. Accessible toilets will be available and accessed from pathways. ACROD parking will be available in the City of Armadale Car Park on the Orchard Avenue side, vehicle access is only available from the Jull Street entrance. Parking can be found around the Armadale CBD. Armadale Central Shopping Centre underground car park will be open until 11pm and can be accessed via Third Avenue or Nerrigen Street. Travel Smart – walk, ride, catch a bus or train, or car pool to the event. The Armadale Train Station is an easy five minute walk to Memorial Park via Jull Street. To plan your journey, visit the Transperth Journey Planner at www.transperth.wa.gov.au or call the Transperth Hotline on 13 62 13. Bring your water bottle and refill at the water fountains in Memorial Park playground and food court. St John’s First Aid officers will be roaming the event. Toilets will be located on Memorial Park.